Learn how to make a simple version of an Ethiopian dish called Tikel Gomen. This one pot dish is both easy to make, and healthy! It’s vegetarian, vegan, and gluten-free and has enough flavor to satisfy anyone! Need a recipe for Injera flatbread to go with this? I’ve got a recipe for that too! And it even has a video! Don’t be deceived by the bland yellow coloring. It bursts with flavor! This is a recipe that I’m not going to forget about again. Definitely give it a try. Don’t let it scare you because it is Ethiopian. You are sure to love it. There’s a reason Ethiopian food is all the rage these days! 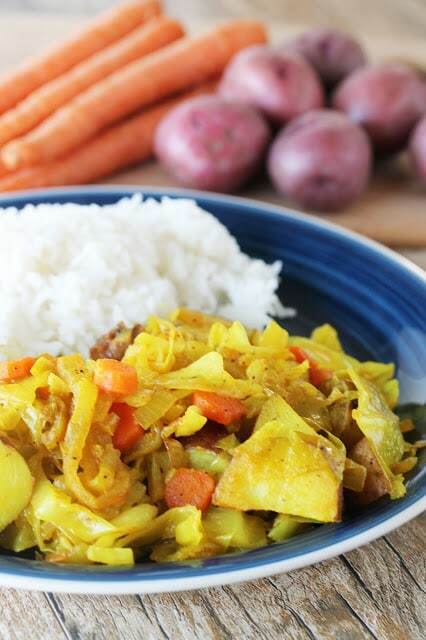 It is a one pot meal, easy to make, and full of veggies. You know you have to try it now! 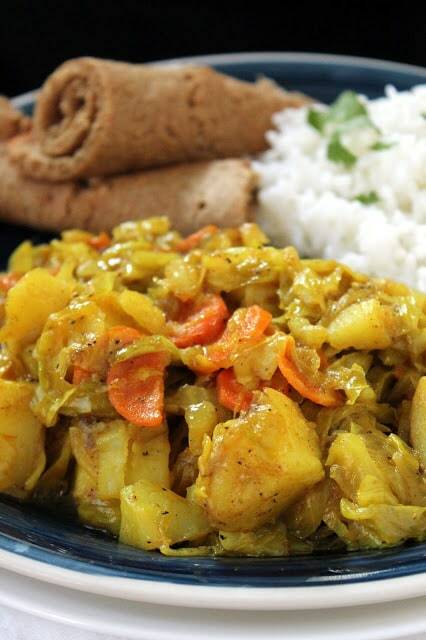 Learn how to make a simple version of an Ethiopian dish called Tikel Gomen. This one pot dish is both easy to make, and healthy! It's vegetarian, vegan, and gluten-free and has enough flavor to satisfy anyone! Heat the olive oil in a 6.5-Quart Covered Stockpot over medium high heat. Toss in the carrots and onion and saute them in the oil for about 5 minutes. Stir in the seasonings (salt, pepper, cumin, turmeric, ginger) and toast for a minute. 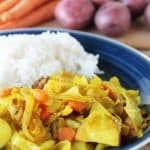 Add in the cabbage and potatoes. Stir to combine. Cover the pan. Reduce the heat to medium-low. Cook until the potatoes are soft, about 30 minutes. (actual time will depend on how big you cut your potatoes).